View from the Tram of Poster that includes Frida Kahlo, Self-Portrait with Thorn Necklace and Hummingbird circa 1940. 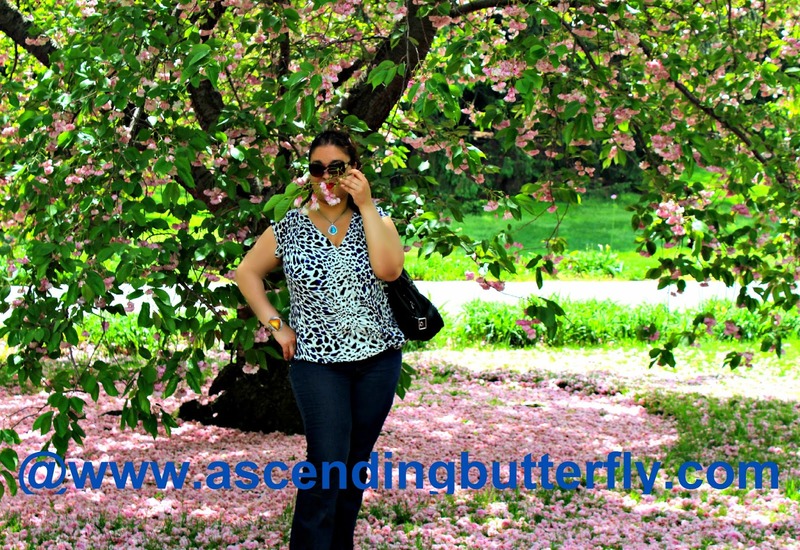 Don't you just love the two butterflies? While Kim Kardashian West boasts that she has been taking 'selfies' since the age of four, it's the true queen of self potraits, Frida Kahlo (of her approximately 200 paintings, nearly 55 are self-portraits), that comes to life from May 16th through November 1st at The New York Botanical Garden. 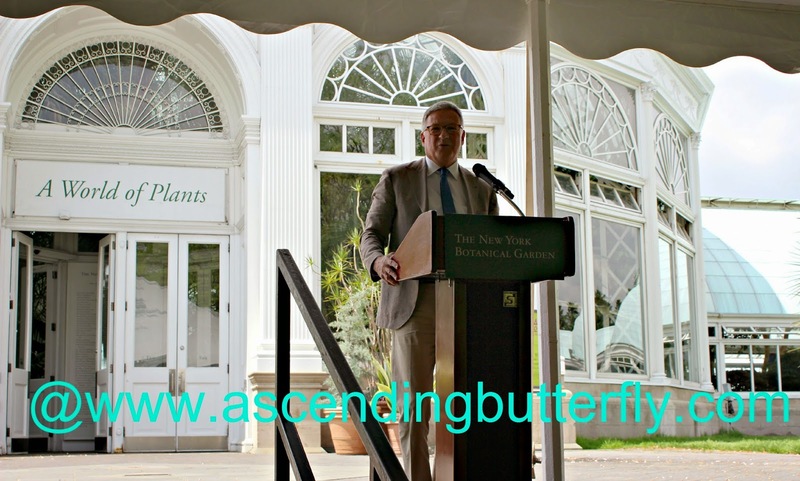 The newest exhibition from The New York Botanical Garden debuts this Saturday and is the first to examine Frida Kahlo's appreciation for the beauty and variety of the natural world as evidenced by her home and garden and the complex use of plant imagery in her artwork. 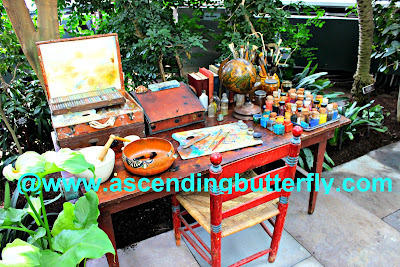 The exhibition features a rare display of more than a dozen original Kahlo paintings and works on paper (borrowed from Private Collections), but what truly stands out is how it re-imagines the artist's famed garden and studio at 'La Casa Azul' her lifelong home in Mexico City. The exhibition was inspired by a trip taken by NYBG staff members to Kahlo's home in Mexico City, known as Casa Azul, it now exists as a museum dedicated to the artists life. They were inspired by the vivid indigo walls and lush plants in the courtyard. I will walk you through the Press Preview, but I needed to point out that this six month limited exhibition will be ever-evolving throughout the course of it's run, you want to check out www.nybg.org/frida to check out what is happening from week to week so you can maximize your experience. Above: Gregory Long let us know that the exhibition is "intended to celebrate not only Kahlo's work, but also the "energy and sophistication of Mexican Culture". 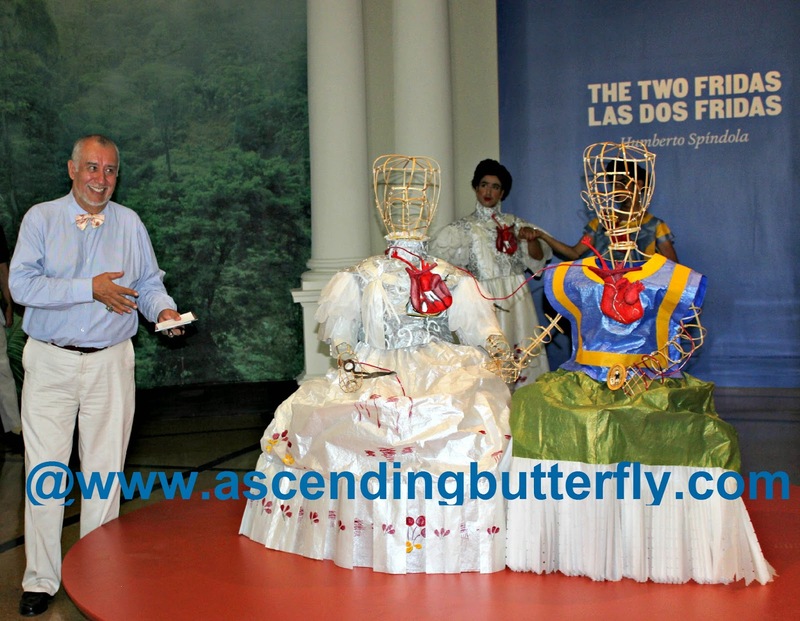 The exhibition was made possible by a variety of sponsors including MetLife Foundation, Bloomberg Philanthropies, Institute of Museum and Library Services, AeroMexico, Azteca, Karen Katen Foundation, Mexico Tourism, National Endowment for the Arts, Art Works, Jose Cuervo, Gillian and Robert Steel, Univision Contigo, Club Med, Modelo Especial, Mex-Am Cultural Foundation, Prestige Paints, and the Federal Council on the Arts and Humanities. 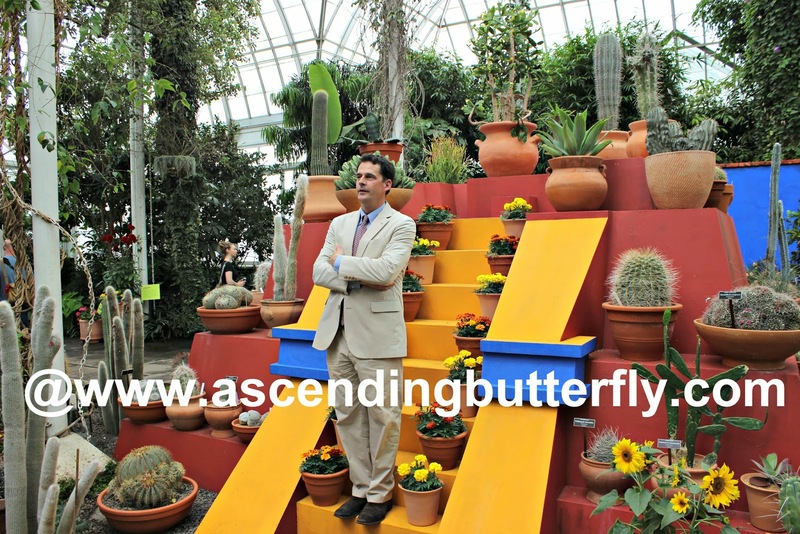 The Enid Haupt Conservatory should be your first stop, it is where Kahlo's re-imagined studio at La Casa Azul (the Blue House) is on display. During the quick walk there you can enjoy the poetry of Octavio Paz, as part of the Poetry for Every Season: Octavio Paz Poetry Walk. (His poems often referenced many native plants and flowers) but it is the exhibition wing at the Conservatory that comes alive with an explosion of native fauna of Mexio found at Frida Kahlo and Diego Rivera's Casa Azul including typical pottery and planters. 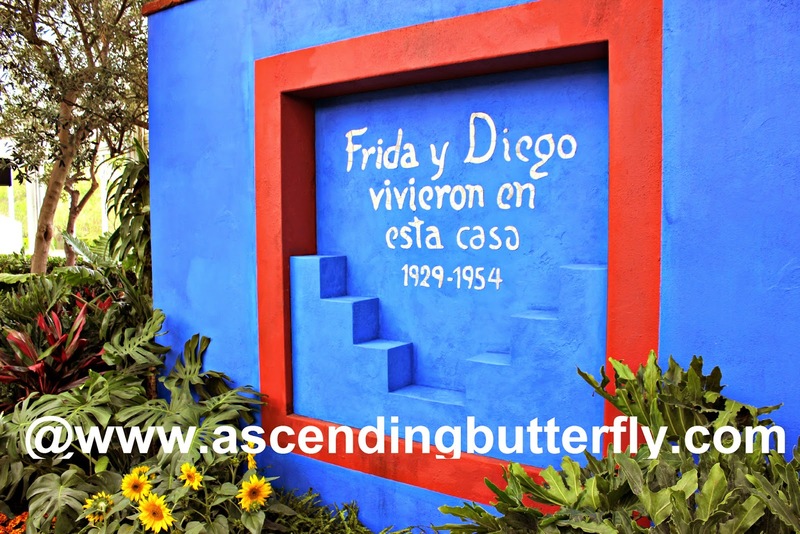 Above: The sign reads "Frida and Diego lived in this house 1929-1954"
Above: The Conservatory was transformed with Cobalt Blue Walls, Lava-Rock Paths, beautiful displays of flowers as well as a scale version of a pyramid at Casa Azul that was created to display pre-Columbian art collected by Frida Kahlo's husband, famed artist Diego Rivera featuring Mexican terra-cotta posts filled with plants found in Kahlo's garden. 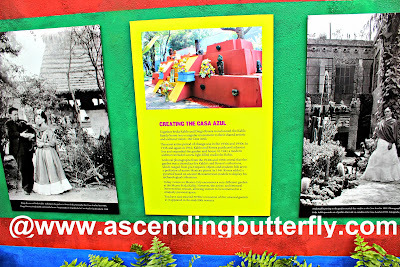 Above: Re-creating La Casa Azul was no small task, but the results are truly impressive! 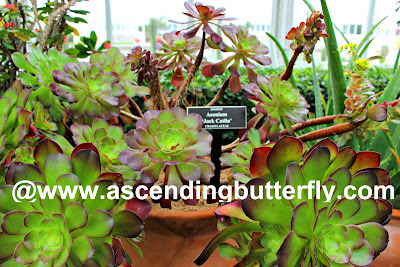 Above: I tried to nab a few shots of the flowers and plants along the way! Above: Calla-Lily are quite prominent in Diego Rivera's work, I couldn't resist grabbing this shot, with living plants that almost appear as they are actually a painting, but these were created by the master painter known as 'Mother Nature'! 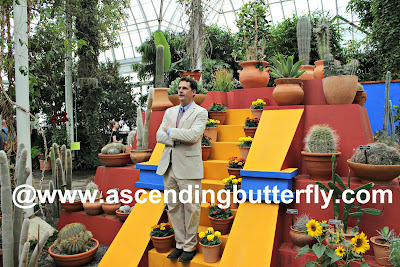 This interactive workspace is inspired by Frida Kahlo's own studio which overlooked the Garden. Above: It was hard to resist the temptation to sit there and be transported, I could certainly use the injection of creativity! Above; They will be performing on both the opening and closing weekend of the exhibition as well as the upcoming 'Canciones de mi Padre' Concert with Linda Ronstadt on June 20th/Father's Day on Daffodil Hill. 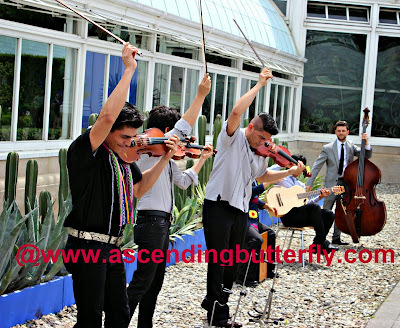 They blend indigenous rhythms and melodies of their native Veracruz with the intricate harmonies of Jazz and Classical Music. I think I nabbed this shot at just the right moment if I do say so myself! Above: If it weren't for the eyebrows I bet you wouldn't have guessed this was her! 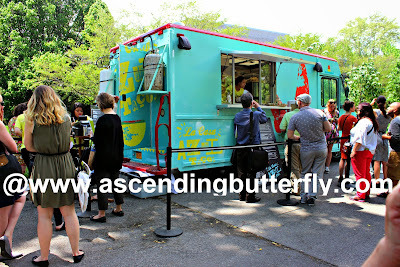 Above: La Casa Azul Taco Truck was a big hit for the hungry press at Media Preview Day! Above: As my instagram of my La Casa Azul Taco Truck lunch was wildly popular, I thought I would share it again here too, I ordered a Fish Taco and A Modelo Especial Beer! It was an absolutely perfect moment, the weather was beautiful, not too hot or cold out, great company, great food, an amazing exhibition and eating outdoors with the beauty of the Garden surroundings. 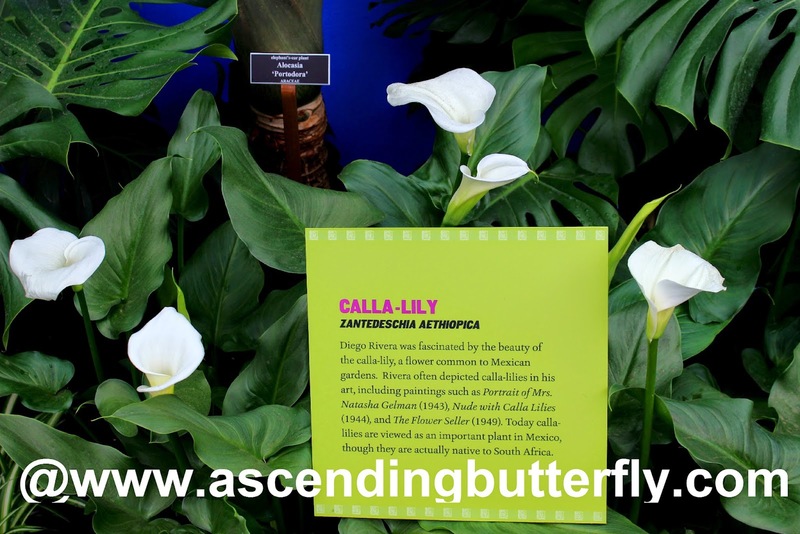 Much like the Orchid Show, the exhibition will also include an evenings version on Select Thursdays, Fridays, and Saturdays from 6:30-9:30 p.m. called 'Frida Al Fresco' allowing you to stroll the exhibition after hours that will include live music performances, an outdoor Cantina where you can enjoy a Modelo Especial Draft (cerveza) or a Jose Cuervo Margarita, and Mexican foodie fare inspired by Kahlo's own recipes called "Frida's Kitchen" a prix fixe menu in the brand new full-service restaurant the Hudson Garden Grill, I greatly enjoyed Orchid Evenings, and can't wait to experience 'Frida Al Fresco' this weekend! 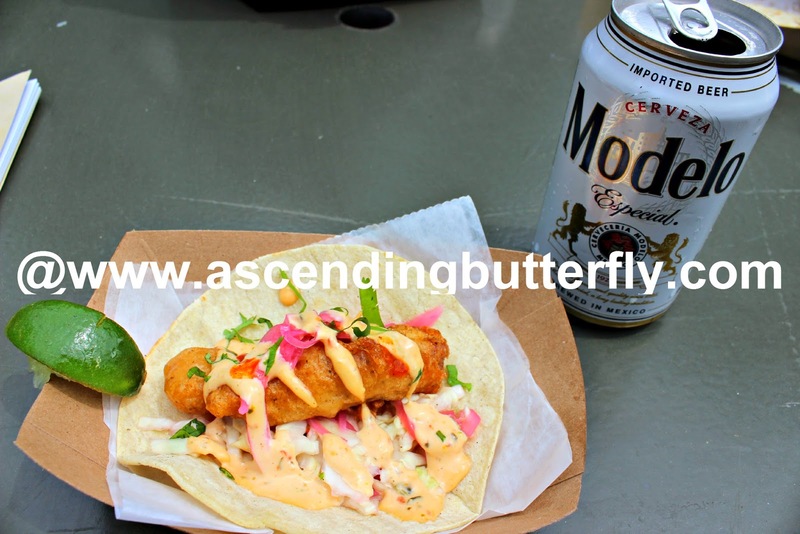 Your advanced ticket purchase for Frida Al Fresco includes one complimentary Modelo Especial Draft or a Jose Cuervo Tradicional Margarita, your choice (and of course non-alcholic beverages are available too if you prefer!). That's me getting in touch with Nature! Frida Kahlo in many ways was ahead of her time, and I feel this exhibition is very much a living, breathing, ever-evolving tribute to the artist and the woman, It is interactive, immersive, creative, and vastly different from any presentation I have experienced of her work. I actually have way more pictures and could go on a lot longer, so I will be covering the show again throughout it's run and hopefully showing you how vastly different the experience is from visit to visit. 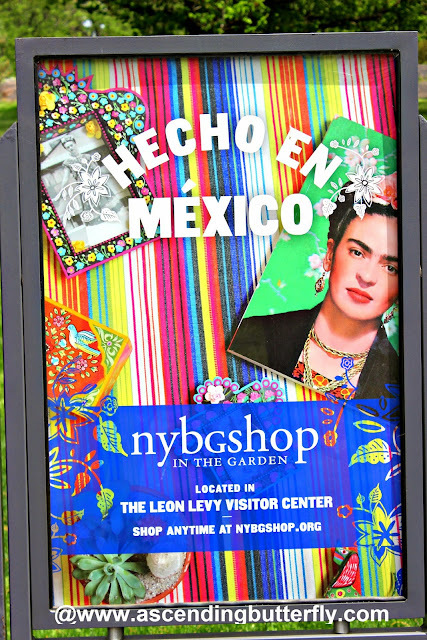 Mexico is actually one of my favorite Travel Destinations, and The New York Botanical Garden has managed to bring a piece of the cultural richness of Mexico right to Bronx, New York! Garden Members can enjoy a preview of the show on Friday, May 15th, and the show opens to the public on Saturday, May 16th. Benefits on the Members-Only Preview Day include Free Parking with a valid Member ID, 20% discount on all purchases at Shop in the Garden, 10% discount at the Cafe, and up to four half price tickets for friends and family. I will also be working on a Pinterest Board that will include pictures that didn't make this post and will also include photos from all the days I visit this exhibit, I will post the link to the URL as soon as it's up. I can't begin to express just how much I enjoyed the Media Preview and I look forward to opening weekend! I have a strong feeling I will be back quite a bit during the course of this exhibition, this Latina Lifestyle Blogger was in paradise! 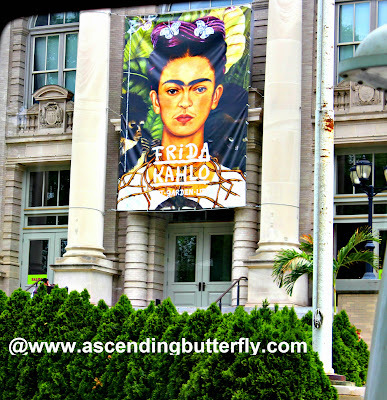 Do you have a favorite Frida Kahlo Painting? If so, which one? Butterflies I know just how much you appreciated the Orchid Evenings Giveaway and I will work on getting one put together for this show as well so please stay tuned! FTC Disclosure: This is NOT a sponsored post, no monetary compensation has been received, and all opinions are 100% my own! I attended a Media Preview of the Exhibition for Editorial Consideration. I am disclosing this in accordance with the Federal Trade Commission 16 CFR, Part 255 - Guides Concerning the use of endorsements and testimonials in advertising, you may check our Giveaway and Disclosure Page for additional information regarding Ascending Butterfly Disclosure. That's so cool! I'm not a huge art person. It's not the I don't like it, I just have never been to anything like this before. Her art looks amazing. 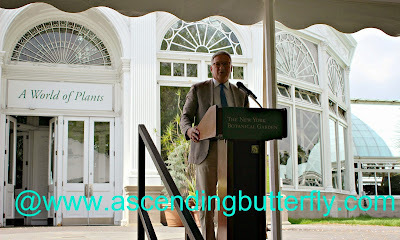 We love the NY Botanical Gardens, but we haven't been there in a while. Sounds like a good time to go back! 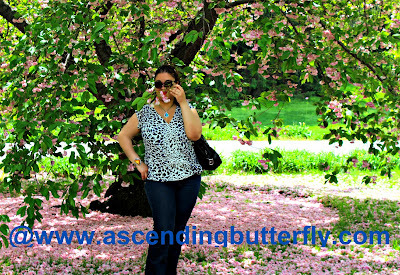 Oh how I love the New York Botanical Garden!! I am going to try to get there to see this! HA! you got me with the RuPaul references. I love Frida! I don't know much about Frida Kahlo or her artwork. But this is near me, I'd be interested to check it out. Thank you ,Thank you I always have been a fan of Frida Kahlo and to be able to see her works here at NYBG in such a beautiful settings is beyond amazing ! 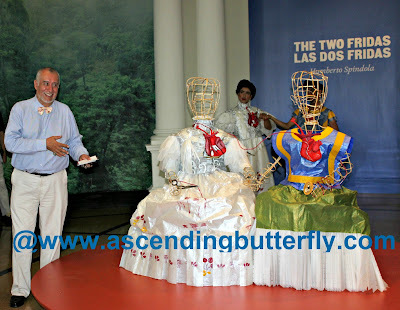 To see her beloved Casita Azul ,and to see Humberto Spindola's paper dress and the surprise twist AMAZING !! What a great exhibit, wish I was closer, we would really enjoy that! This would be such a fun event to attend! I don't live close, so I'm a bit bummed to miss out, but the photos you shared are quite lovely! I always loved Frida Kahlo's work. What a fun event! I would definitely love to learn more about Frida Kahlo. She sounds like she was an interesting person. I believe Frida Kahlo was above her time. Her artwork is amazing and something I have always admired. Seems like she was an amazing woman. 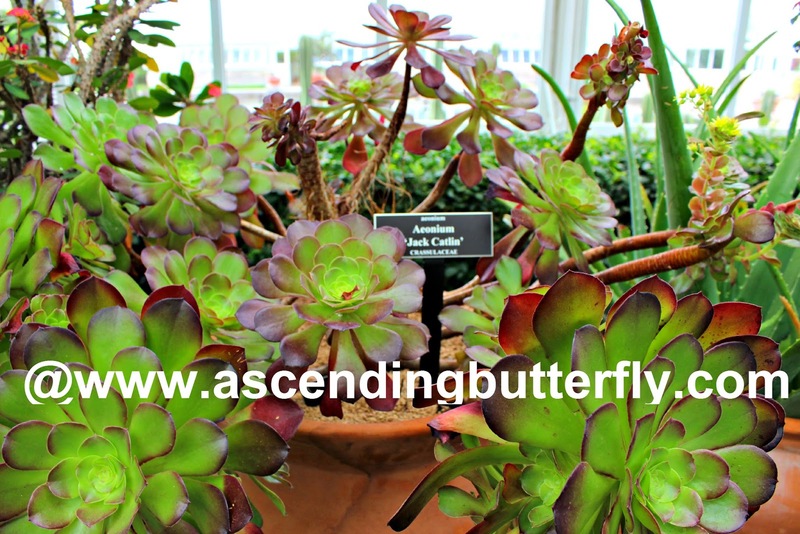 They have an Atlanta Botantical Gardens and I have yet to go. I am going to NY this summer so I should definitely check this out! @Kiwi - Are you coming in for BlogHer? I will be there, we definitely need to meet up while you are here! I love the sound of this exhibition. So interactive and immersive. It sounds like the staff put an awful lot of time and thought into making this Frida Kahlo exhibition unique. I have a colleague heading to NYC in a couple of weeks, I'll be sure to forward this review to her anc encourage her to check it out, if only so I can live it vicariously through her! Sounds like an amazing exhibit! I wish there were things like this around me. 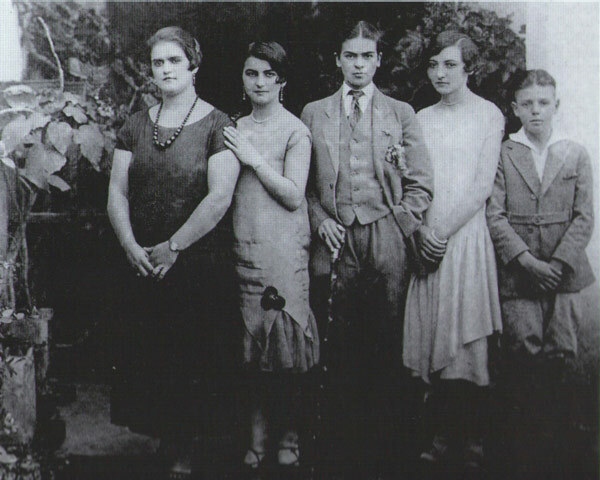 I love, love, love Frida! Everything is always so bold, vibrant and colorful! I'm not near this exhibit but would for sure check it out if it came to my area! 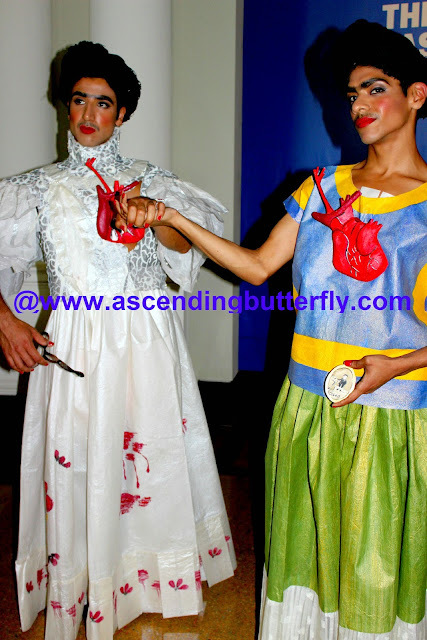 Frida Kahlo's work is so amazing and she was so ahead of her time. What an awesome exhibit to have in your city.